Pre-heat a waffle iron to medium heat. Dust a work surface with a little bit of flour. With a rolling pin, roll each puff pastry sheet out just a little bit to smooth the surface. Cut the puff pastry into quarters that fit into each section of your waffle maker. Place the puff pastry in the waffle maker and cook for about 5 minutes, or until crisp. Repeat with the rest of the puff pastry. While the puff pastry cooks, make the cinnamon sugar. In a large bowl, toss the sugar with 1 teaspoon of cinnamon. When the waffles are done, remove them from the waffle maker and, while they’re still hot, place them one by one into the cinnamon sugar and toss to coat. 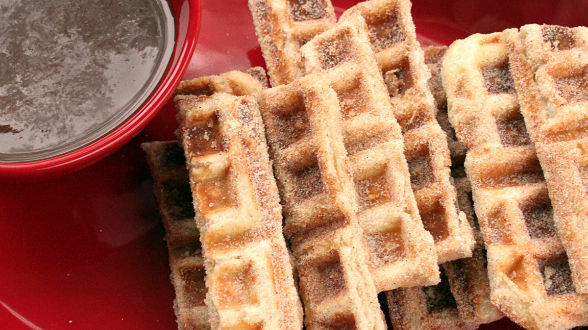 Remove from the waffle maker and cut each waffle into 4 strips to resemble mini churros. To make the chocolate dipper, heat in the cream over medium-high heat until the cream is hot, but not boiling. Whisk in the chocolate chips. Season with cinnamon and ancho chili and salt. Serve the churros with chocolate sauce alongside for dipping. In Recipes-list.com we have selected the most viewed recipes from category - uncategorized . Enjoy the best recipes specially selected for you! 3-Minute Churros is the right choice that will satisfy all your claims.